Is it too early to start reaching for those festive colours? My answer: it's never too early to wear what we like. While the combo of red and green makes me think of Christmas, it's a colour match that can work well in any season. Bellow you can see one of my most recent illustrations that features a red and green outfit. The illustration started its life as a sketch but then I decided to add watercolour. 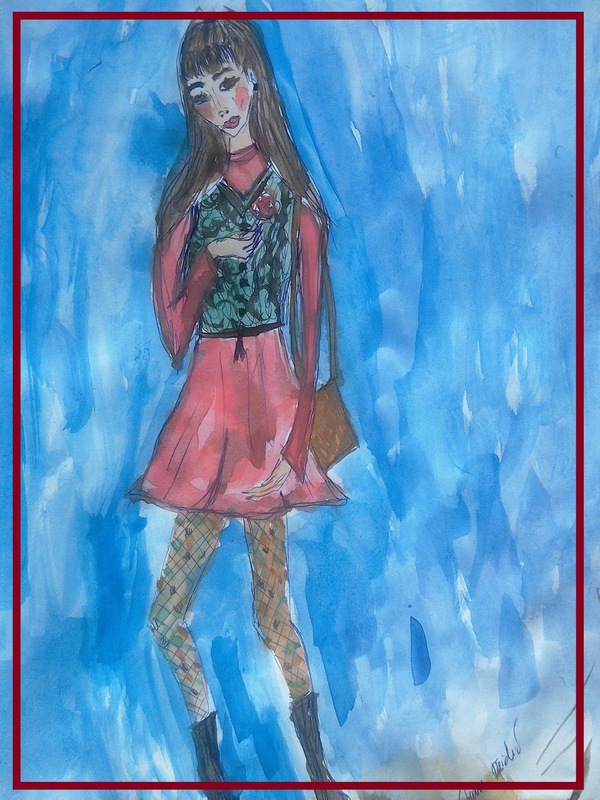 Anyhow, this fashion illustration depicts a girl wearing a red dress and a green vest, paired with a brown bag, black boots and tartan tights. Isn't this a great idea for an autumn styling? I need to buy myself some plaid leggings or tights. It is a great way to add pattern into our wardrobe, I don't know how I didn't think of it before. Red and blue can be such an eye-catching colour combo. Perfect for creating uniform looks, this colour combo can look very glam if you opt to make it more feminine. 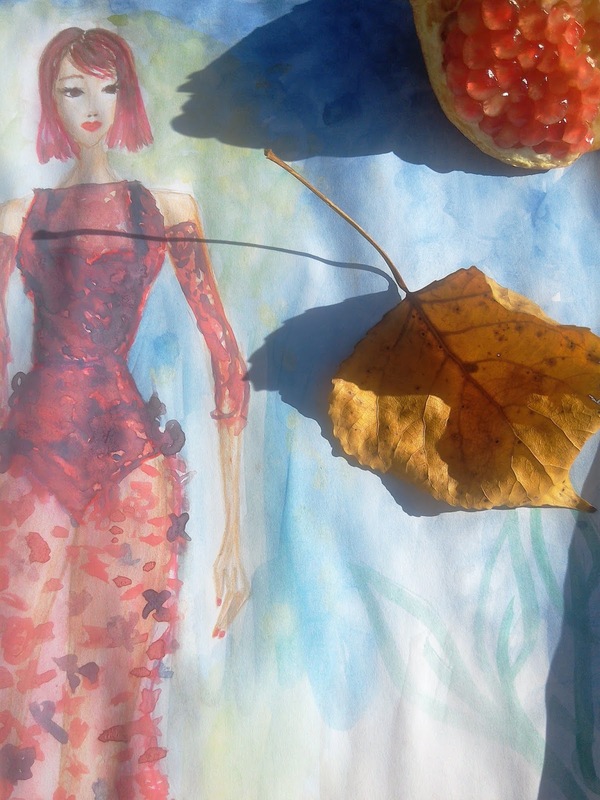 Bellow you can see my mixed media (watercolour and coloured pencil) fashion illustration of a red and blue sheer dress. I do like the sheer trend, especially when it comes to gowns. I think a dress like the one I illustrated would be a perfect choice for getting all dolled up. The festivities are not that far away, and I'm already dreaming of the perfect dress. I wish there was a way for this sheer dress with flower applications to manifest itself magically in my closet. However, who knows? I might find the time to sew it some day. There is something royal about the combo of gold and black, isn't it? I envisioned this gorgeous gown with yellow applications to fit that royal vibe that's been trending (you know with all the historical TV shows and films that are coming out). Isn't this extravagant gown gorgeous? Truth be told, gold and black are not the only colours I had in mind. 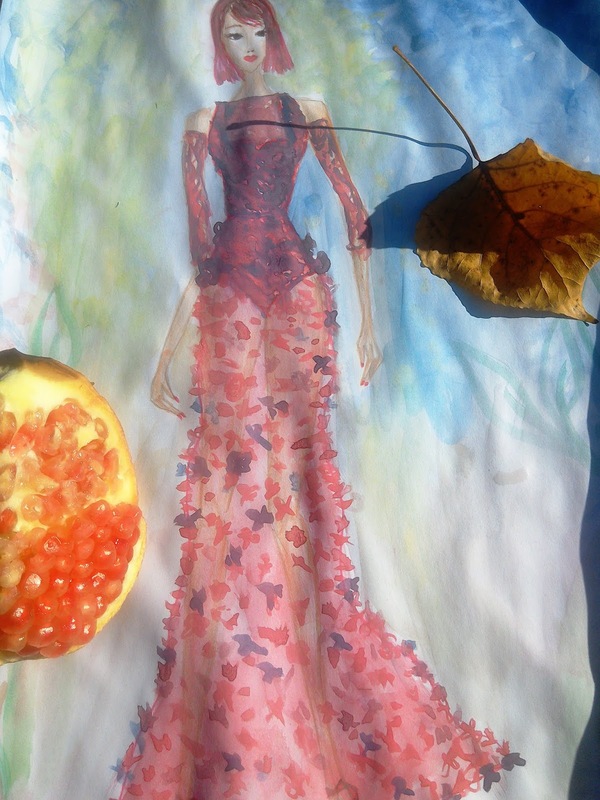 If you look at this watercolour painting closely, you'll be able to spot red, blue and orange colours as well, but gold and black are the dominant colours for this dress. I actually painted this dress over a fashion illustration I already shared because I was short on time but I like how it worked out. It's an improvement, I'd say. Burgundy and pink may seem like an usual colour combo, but it's not that hard to pull off. For example, bellow you can see me wearing a burgundy turtleneck underneath a pink poncho blouse. Paired with jeans, this colour combo doesn't look too extravagant. 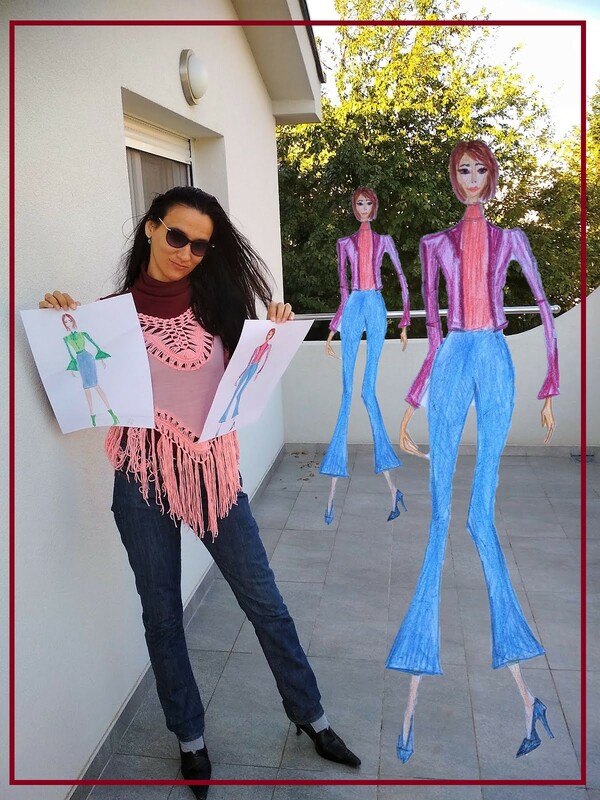 If you pay attention to the fashion illustration I'm holding, you'll be able to see one similar outfit: a burgundy blazer paired with a pink top and jeans. My tip of the day: when you're not sure whether you can pull some colour combo in an outfit, reach for a nice pair of jeans because they have a way of balancing it all out. That's what I did, both in my illustrated outfit and in the real one. What to say about green and blue? These two gorgeous colours come in so many lovely shades. 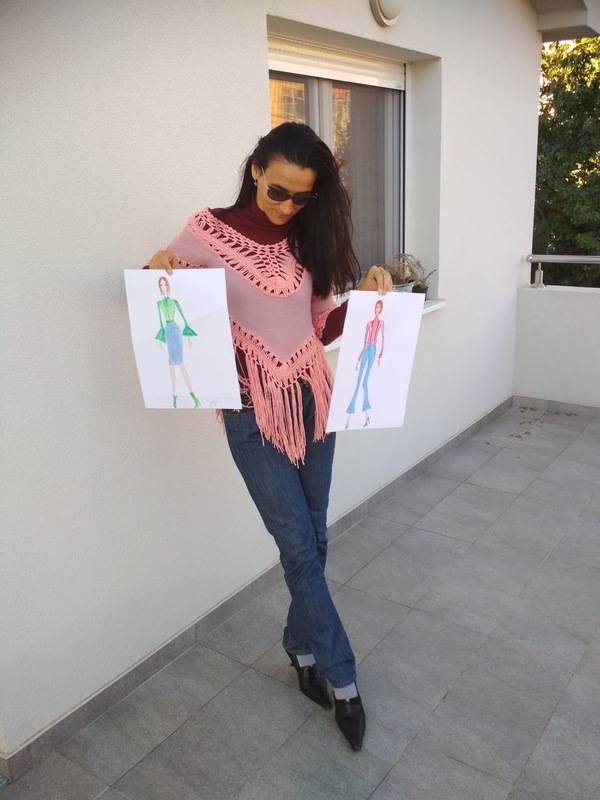 If you take another look at the above shared outfit, you might notice the other fashion illustration I'm holding, the one depicting a green and a blue outfit. Well, besides that illustrated look, I also have an outfit proposal featuring a combination of these two colours. 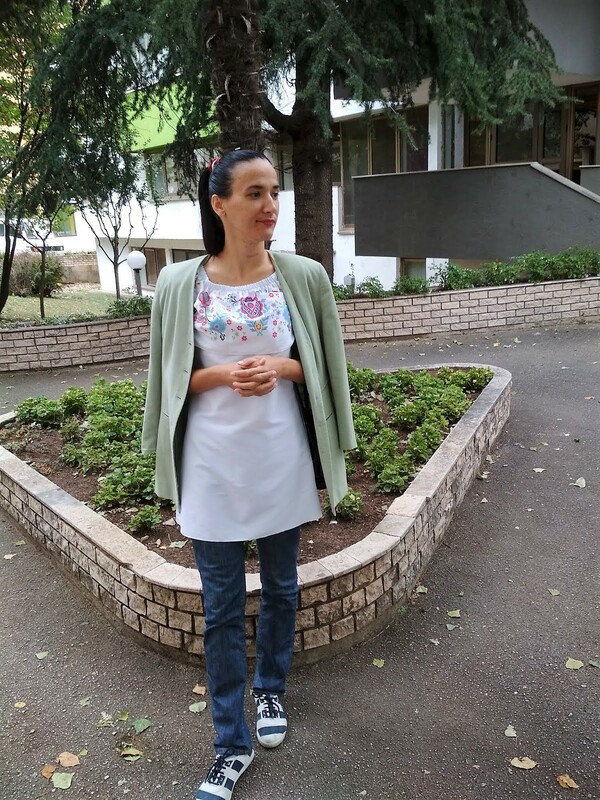 This time I opted for a vintage mint blazer, a white tunics and a pair of jeans. I wore the blazer over the shoulders because it was a warm day and because I'm a fan of this unpractical trend. 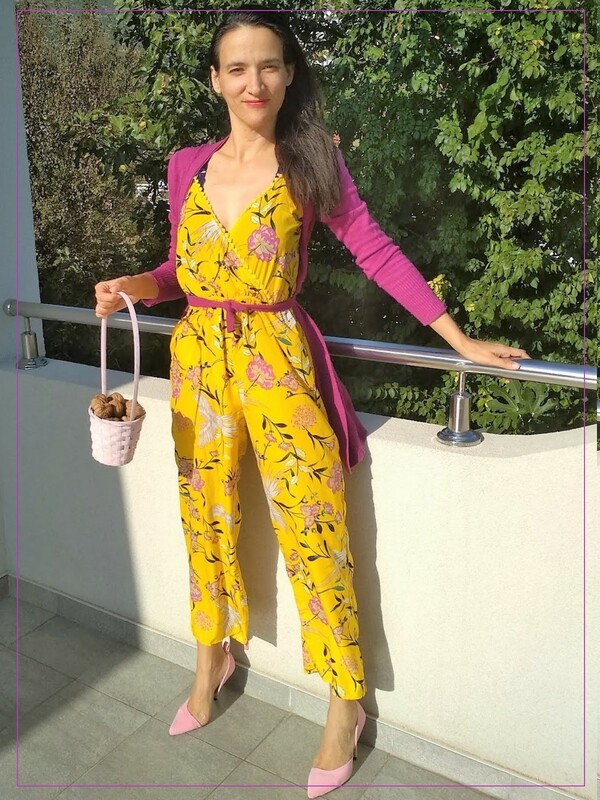 I promised to show you a way to style this yellow jumpsuit in autumn, haven't I? Well, I decided to pair it with pink! I wore a pink cardigan over it and choose some baby pink heels to finish the outfit. If you're looking for a feminine and dressed up way to wear a jumpsuit in autumn, try pairing it with a nice pair of heels and a cardigan. If you want the outfit to be super girly, why not give Barbie colours a try? Jumpsuits can be so versatile. If you're looking for a way to wear your summer jumpsuits in autumn, layering should do the trick. We should take advantage of this period while we still get away with styling summer items because it won't last for long. That would be all for today. As you had the chance of seeing, the colours of autumn inspire me to opt both for traditional and non-traditional autumn colours. It's all about having fun with exploring different colours and shades. How have you been doing? Are you enjoying autumn? Are you feeling inspired? Do you love to wear colour? If yes, what colours do you opt for this time of year? Thank you for reading and commenting. Have a lovely weekend! thank you, I agree that it's a great pairing. I think the yellow and pink is my personal favorite. Only because it's so unexpected, and bright and happy!! thank you dear, I hope you'll have a relaxing Sunday. I very much like your first two fashion illustrations and agree that that dress would be amazing in real life- I love that Tartan fun outfit too. I love red and green together and I will wear that at any timee, not just Christmas!!!! Your jumpsuit looks lovely with the pink cardie! Such a creative post. I really appreciate your writing style and the illustrations are divine. I agree it is never too early to reach for festive colors. You look really pretty and all of these outfits. I especially love the pink and yellow as it is very sunny and happy. You illustrations are so lovely! I love all of these color combinations, especially pink and yellow! Sai Ivana che credo che queste siano tra le migliori illustrazioni che ti ho vist fare? Mi piace il mix di colori, il tratto, i dettagli! E tra gli abbinamenti di colori quello che vorrei proare e rosa e giallo. I love that each season can inspire so much creativity in us. Beautiful illustrations! thank you, I wish you a happy weekend too! Yellow and pink is such a nice combo and I love that jump suit on you! Amazing, i love the Illustrations with the long Dresses! Oh my gosh, amazing. 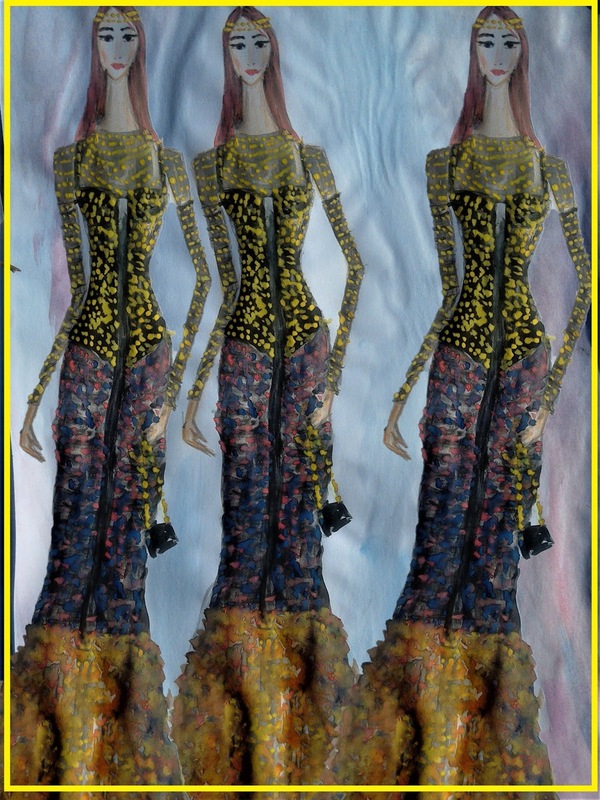 I wish you could just take these illustrations to a seamstress and make them come alive! I agree, Fall is just so beautiful and one can't help being inspired by nature. Your illustrations are beautiful as always. I LOVE the black and gold gown. Such an elegant piece. I also like the blazer and jeans combo. Its all about the layering this season :) You look fab in the yellow jumpsuit. I do love yellow as well as red, and neutrals. Vorrei saper disegnare come te! Sei favolosa nella tuta gialla!!! Very interesting ideas, I like the way you see and practice fashion because it is very important to see trends and fashion from our own original perspective. Your illustrations a great darling, it would be great if you could get someone to make them for you!!! Love the illustrations and the colour combinations! You have a special talent, these are lovely! 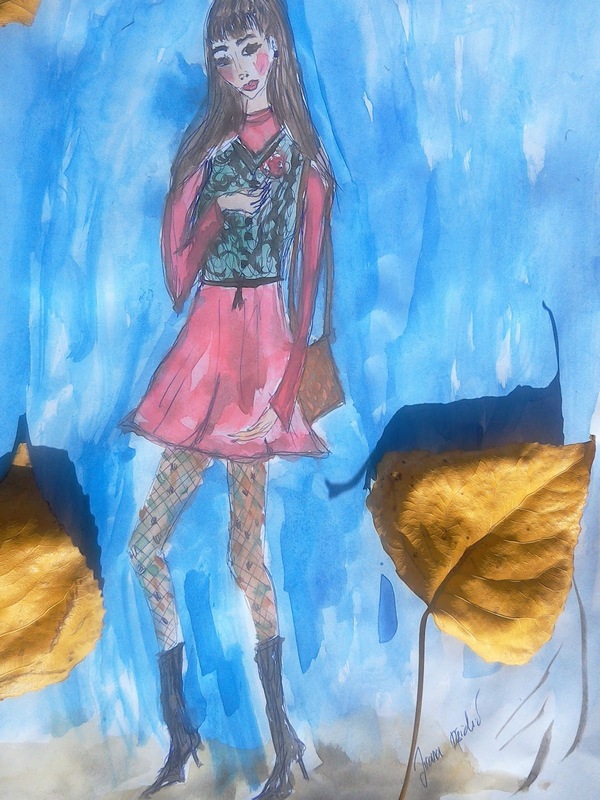 I like your autumn-inspired illustrations and your "real worn" outfits very much. If you ask me, which of the illustration-dresses I would prefer to wear, I think it's the maxidress of your first drawing. I think this would be a wonderful festive dress for me :-)) And my favourite "real"outfit is the yellow jumpsuit with the pink cardigan - this is a great firework of colors! don't worry, the start of the school year was busy for me too. I adore both illustration as always, Ivan and I think my favourite combo would be gold and black! How cute is this post,thanks for sharing. C'è poco da fare le tinte autunnali sono davvero uniche!!! Tinalità ricche, preziose e calde! si, sono le tinte molto belle. Grazie. These illustrations are gorgeous and I like these combinations of colors and outfits but yellow and pink is my favorite! You look absolutely fabulous in that outfit, dear! So many beautiful outfits, Ivana, both on paper and in real life. I love how you combine 3D elements with your paintings - it adds such depth. The black and gold (multi-coloured) outfit really resonates for me, the textures, the colour combination, so beautiful. Thanks for sharing these. thank you Melanie. I'm glad to hear you like the multi-coloured outfit so much. You are so amazing at art! I love these looks! That yellow jumpsuit is so gorge! You look amazing! Ti auguro un'ottima settimana, cara Ivana! thank you dear! Nice to hear from you again. awesome job as usual my friend :D Loved it!!! You are so right, dear Ivana, autumn really has the most beautiful colour palette. And you know not only to draw in amazing colour combination but also to wear them! As you know I'm a huge colour lover and therefore I adore what you show. Your illustrations turned out great and hopefully one day you will be really able to wear these amazing dress you hope finally to possess. I love also the outfits you created. Corresponding your question: in autumn I love the same colours as usual and opt especially for colours like burgundy, brown and during this season even grey and black :) Happy week! I completely agree with you about Autumn and gorgeous color of nature. I think that it is season when nature looks most beautiful. I really like your ideas for color combinations and illustrations. Dresses looks amazing, you are so talented. I love the colors that appear when autumn arrives, I see that this station has inspired you a lot, the illustrations are great, my favorite is the girl who wears the tartan stockings, your technique is getting better and better. Congratulations! Tartan stockings would look so cool! Thank you. Happy November! Love all of your drawings and looks! Ivana! These illustrations are looking so professional! You have such a great skill when it comes to detail; the embroidery on both of the dresses feels as though it's lifting off the page :) Hope you have a fabulous weekend! Hi Ivana! 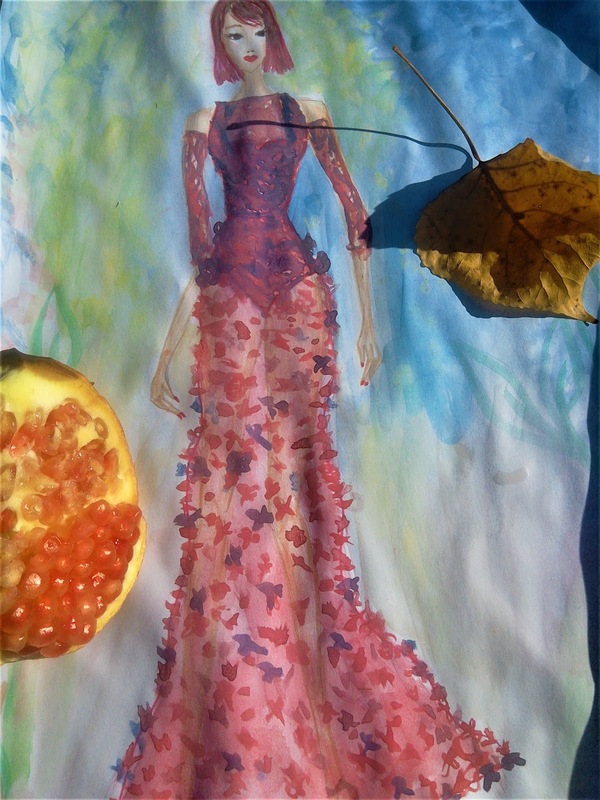 I really like your new fashion illustrations - each of them is special and I see that you inspired by autumnal shades. 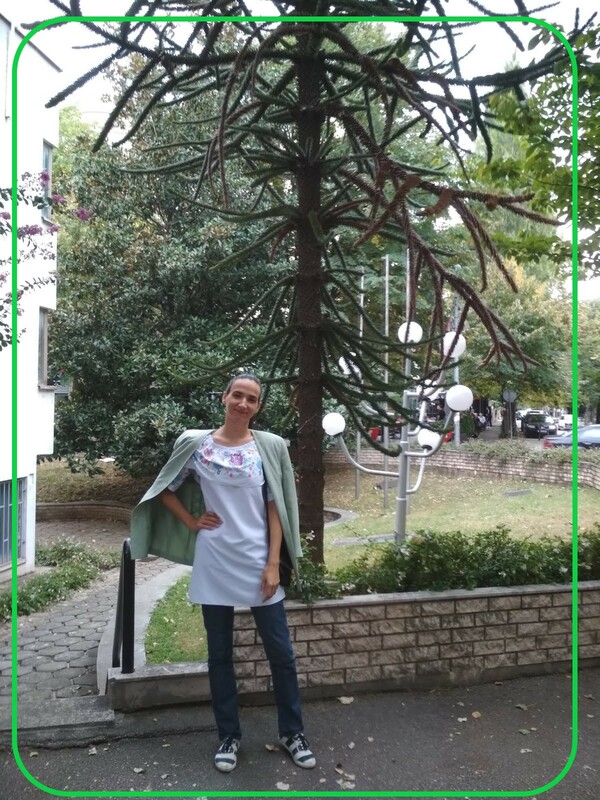 I love that illustration with your perfect dress - sheer dress with floral applications would look terrific and I hope that you'll find time to sew it, I'm sure that it would be magnificant and extraordinary <3 What's more, personally I also love autumn - in my opinion, there is no more beautiful and more colorful (with a little bit of nostalgia) season of the year. You look beautiful Ivana! I love that yellow outfit! You do such an amazing job with illustrations! 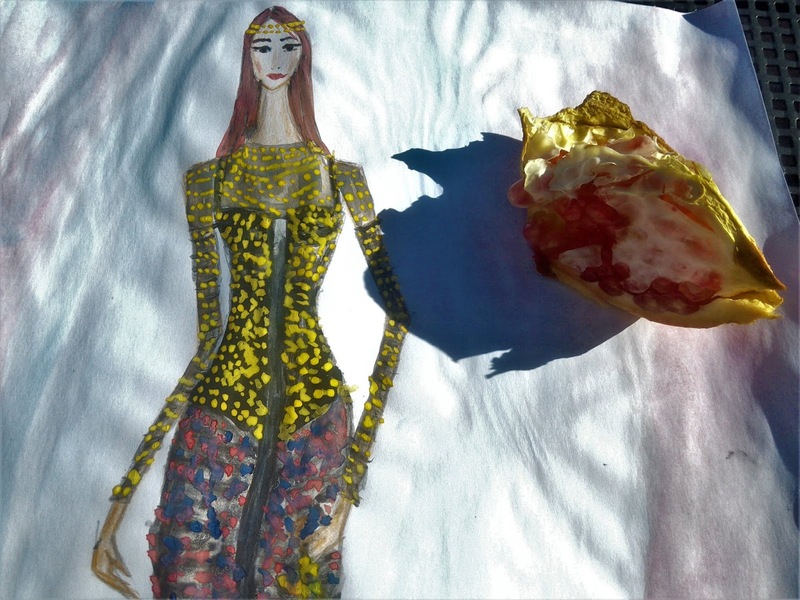 Loved these fashion illustrations, you are so talented Ivana. Wish you a great wekend! NEW FASHION POST | THE COOLEST FOOTWEAR FOR FALL. Wish you a lovely saturday! all the photos here is very inspiring. Love the illustrations, i really like autumn colours specially the red and oranges! and your looks are lovely, the second one is my favourite! So creative as usual! Fall is also one of my favorite seasons :) with the beginning of cold I adore to take a book and sit on my couch with a warm cup of coffee! I also think fall is the perfect season for indoor activities, like drawing and writing, thinks that may enjoy as much as I do. Love the pictures with the fruits and your second look, so full of color and vibrant energies! I couldn't agree more. It is a wonderful season indeed. I love you artwork with a passion. It's always a pleasure to see your work. I am still enjoying your work on my office wall. So proud to have your art and friendship! thank.you Jerry, I'm so glad you like my artwork. activation.kaspersky.com – Kaspersky is a Russia-based multinational company that offers cybersecurity and antivirus applications for personal and professional use. There are undoubtedly countless ways by which you can flourish your trade with 3D Architectural Interior Rendering. With 3D rendering services, you unleash doors of better opportunities. When you choose to utilize virtual reality opportunities, you discover more smart ways to make customers and, eventually, business profits. Even minor mistakes can be detected easily, Visit 3D Architectural Interior Rendering which improves accuracy and results that are more productive. This does not only cut down extra cost of redesigning the scheme but also consumes lesser time than traditional methods. 3D Walkthrough Animation Services :It is a supplementary benefit for those who are into the real-estate business domain as it becomes easier for them to make deals with the clients. On the other hand, marketing and advertisement are other big factors in which the rendering services can be used effectively. Learn how to download and install Windows 10. visit our website, and know how to Install Windows 10 from USB. We will help you create Microsoft office 365 Login account. visit our website, and know how to create Office 365 account. Enter mcafee serial number at the time of downloading the McAfee activate antivirus from mcafee.com/activate and protect your PC from the hackers. uninstall Windows 10 | How to uninstall Windows 10? McAfee Installation Product Key - Are you looking for McAfee security Install and if you facing any issue due to install McAfee Antivirus now go for How to Install McAfee Antivirus?